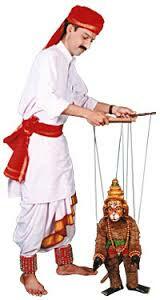 Since ancient times, puppetry has been one of the most popular sources of entertainment in India. Puppet shows are viewed and liked equally by children and adults. In addition to providing entertainment to the public, puppetry in India provides a good employment opportunity to many. Besides the classical dance forms of India, Indian puppetry too has its own significance and importance. Mostly Indian puppet shows are themed on stories like Panchatantra Tales, Hitopadesha Tales, Moral Stories, Jataka Tales and Stories from Vikram and Bhetal and mythological stories. India is rich in the varieties of shadow puppets that are showcased in different regions. Mostly flat puppets made of leather (other materials) are held by the puppeteers on the rear side of a white screen. The artists play the puppets based on the story and the audience who sit in front of the white screen enjoy the shadows / silhouettes of the dancing puppets. Hence the name 'shadow puppets'. The puppets are stuck vertically to cane or bamboo sticks and the puppeteers skillfully play the puppets with light and sound effects. 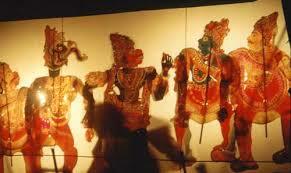 Shadow puppets are known by different names in different states in South India. In Andhra Pradesh it is popular as Tholu Bommalata and is known as Togalu Gombe Ata in Karnataka. In the Ratnagiri area of Maharashtra, it is known as Chamadyache Bahulya. And in Tamil Nadu this is known as Thol Bommalattam. In Odisha, this is known by the name Rabano Chaya. The size of the puppets, the color and materials used slightly varies from one region to the other. In this form of puppetry, strings are held by the hands of the puppeteers. These strings are tied at the joints of the puppets. 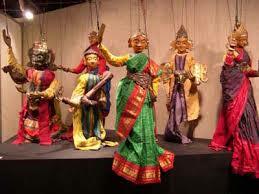 Mostly these puppets are made of soft wood, stuffed cloth, String puppets are also known as marionettes. These puppets have jointed limbs and arms for the flexible movement of the puppets. The traditional string puppet shows of Rajasthan is the most popular ones and are known as Kathputali. The puppets of Rajasthan reflect their tradition and are very colorfully dressed. 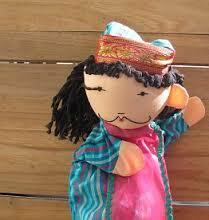 String puppet shows are also popular in other regions of the country and are called by different names. This is known as Putol Nach in Assam, In Karnataka, it is known as Gombeyatta and in Maharashtra, it is known by the name Kalasutri Bahulya. But unfortunately, this is almost at the verge of extinction and needs revival. In Odisha, these are called Gopalila Kundhei while in Tamil Nadu, it is known by the name Bommalattam. As the name indicates rods are used by the puppeteers for skillfully playing the puppets. Hence the name 'Rod Puppets'. This form of puppetry is mostly found in Eastern parts of India. It is popularly known as Putul Nautch in West Bengal. The traditional rod puppet of Bihar is known as Yampuri. Though this is not much popular in Odisha yet it exists and is known as Kathi Kondhai. These puppets too have joints for flexible movements. The puppets vary in size and color from region to region. As the name indicates glove puppets are mostly made of cloth and are worn on the hand by the puppeteers and they use their finger movements for playing the puppets. Pavakoothu of Kerala is a popular glove puppetry. Presenting a puppet show involves much of creative effort and proper coordination of the artists i.e puppeteers However silver screen movies and small screen programmes are ruling the roost. 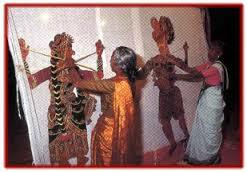 Unfortunately this wonderful art of puppetry is gradually fading and it's time to revival this wonderful traditional art form of India. Puppet shows emotionally motivate the physically and mentally challenged children. The Centre for Cultural Resources and Training (CCRT) is taking all efforts to encourage the puppeteers across the country and giving much support in all aspects.